AquaBond® low-cost, disposable Static Mixers thoroughly mix and apply AquaBond pool and spa adhesives, sealants and repair compounds. How AquaBond Static Mixers Work: A series of alternating baffles within the mixing tube repeatedly divide and recombine the adhesive. 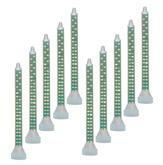 The adhesive enters as 2-part material and exits the tip perfectly and precisely mixed. They eliminate old-fashioned, messy hand-stirring and make it easy for you to place the adhesive precisely where you want it. You can trim the tapered nozzle to adjust the bead size. Just toss the used tip into the trash when the job is finished. Fast, clean and easy! Neat and clean to work with. No mess. 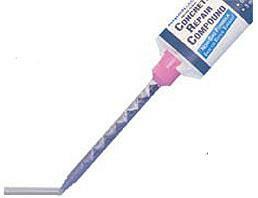 Mixes the two components of AquaBond adhesives thoroughly and instantly, resulting in a perfect mixture every time.